I've been working on a filet crocheted crib cover for a while now. I've never really done a large filet project. Only a few small things. So this was a challenge for me. It all started because I found this really great-looking pattern on etsy and I had to get it. It was an old filet graph pattern that looks like a Laura Wheeler / Alice Brooks type. (Although there is no mention of their names on the pattern). The pattern is simply called Design 915. There's no date either. It just says printed in U.S.A. at the bottom. (Even though I purchased this from a Canadian lady on etsy). 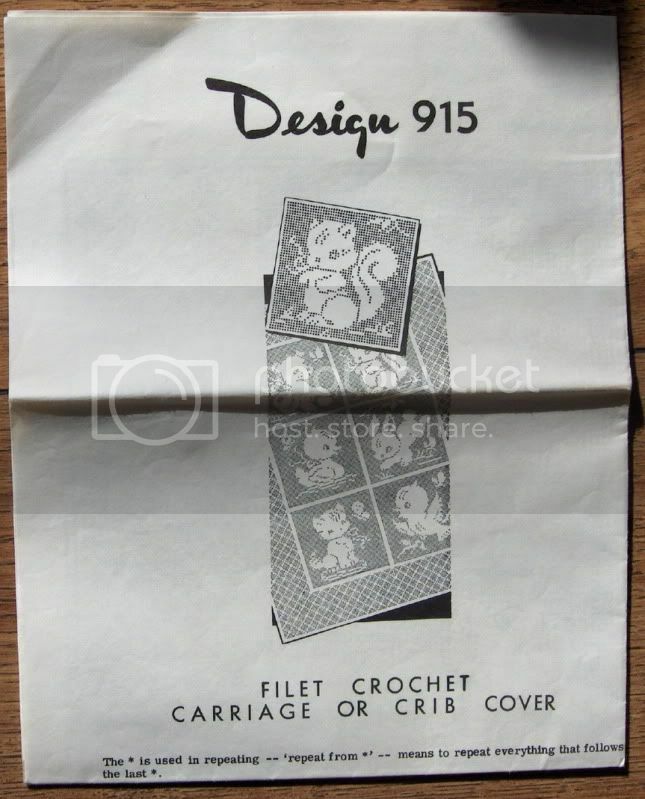 I think it was a pattern you ordered through the mail and looks to be around the 1940's or 1950's, (just guessing here by the style of the baby animals). This is the back, (even though it is the same as the front except you can see the joining seams where I connected the six filet squares). I used size 10 crochet DMC Cebelia crochet thread. Six colors and I had to order two skeins, (or are they called balls? ), of each color in order to finish each square. So that's 12 skeins/balls. Plus two pastel rainbow skeins/balls of South Maid size 10 thread. Also a steel Boye size 7 1.65mm crochet hook. I had major cramping and numbness in my right hand from using such a small hook and I could only do a little at a time. I know you're supposed to "block" this type of crochet but I haven't done that. 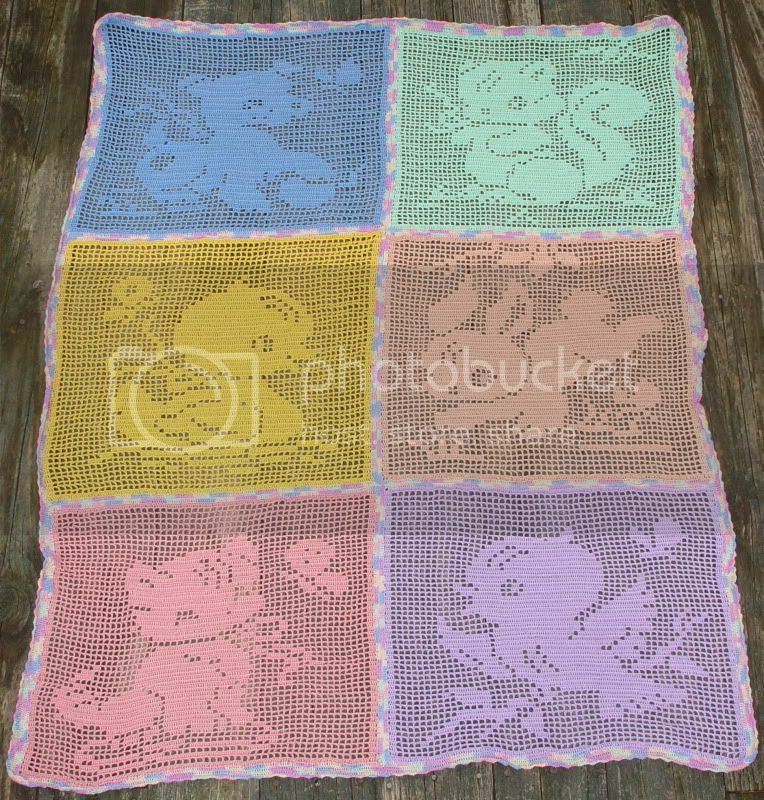 I probably should have done that to each square prior to attaching them all and putting on the border. Ah well. I love the vintage look of these critters. They sure don't make designs like this anymore. This is lovely! You've done a great job with it and what a fun pattern. BEAUTIFUL! What a keepsake too. Love this! I love things that have this vintage look. Very nice work! It is well done, and very cute. Good work! So pretty! 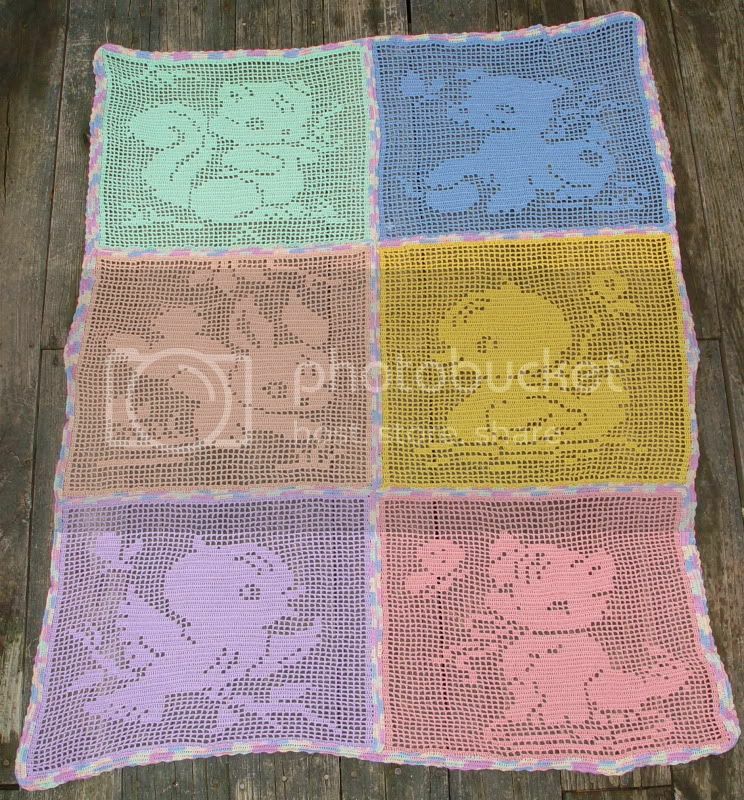 I agree, the vintage animals look so cute on the afghan. Love it! That is so lovely! Looks like it was a lot of hard work, but totally worth it! This is so cute! I really love it. How much time did it take?